but be under no illusion about how good the three bands were that joined us at Shakespeares last night. The first time in over 200 shows we’ve had an amp blow up on stage (i think? ), and a first gig for KC Video who set the ball rolling for Chris Murphy & Boxer Genius and Stiv Cantarelli & The Silent Strangers. Big thanks to them and those few who came out to support quality live music. The next WagonWheel Presents… show is on Saturday May 30th when we welcome back Roger Davies who headlined our very first night back in 2006. Joining him at Shakespeares will be Yellowcake and Mat Wale. A full preview for this show can be found here. On the evening of Sunday February 7th, WagonWheel Presents… brings our WagonWheel Weekend to a close when US singer/songwriter Rod Picott returns to The Greystones. Support comes from Mat Wale. Advance tickets priced at £10 for Sunday night’s show are available from http://www.wegottickets.com/f/9440 and the venue (12-6pm) or entry on the night will be £12. Weekend tickets are also available from http://www.wegottickets.com/wagonwheelpresents and include entry to all five shows across Friday, Saturday and Sunday. Doors open 8pm for a 8.15pm start. It’s been 15 years since Rod Picott laid down his work belt, picked up an acoustic guitar and put a permanent end to his gig as a sheet rock hanger. He’d been writing music in private for years, but it was 2001’s Tiger Tom Dixon’s Blues — a debut album that bridged the gap between between folk and Americana — that officially introduced him as a singer/songwriter, kick starting one of the more acclaimed careers in modern-day roots music. Since then, he’s focused on a different kind of construction: building a catalog of songs that spin stories of hard work, heartache and the human condition. On Fortune, he turns his focus inward, using himself — not the people around him — as the album’s main character. It’s his seventh solo release, written and recorded after years of heavy touring. Looking to make a record that could serve as a raw, authentic document of his live show, Picott recorded Fortune quickly, cutting six songs during his first day in the studio and finishing the entire album within a week and a half. Musicians like Slaid Cleaves, Ray Wylie Hubbard, and Fred Eaglesmith would claim it’s for the better. All three have recorded Picott’s songs, showing their support for a self-sufficient songwriter who plays most of his shows alone, relying on his voice and acoustic guitar to pack a punch. Fortune gave him a chance to put together a small band, though, with Will Kimbrough (Steve Earle, Guy Clark) handling the electric guitar parts and producer Neilson Hubbard (The Apache Relay, Matthew Ryan) doubling as the group’s drummer. With Lex Price joining in on bass, the group kept things as real and raw as possible. They just plugged in and played. Decades ago, during his sheet rock days, Picott promised himself that he wouldn’t release an album until he figured out who he was as a writer. Having a good voice wasn’t enough; he needed an opinion, a perspective, an ability to turn the world around him into music. With Fortune, he shines a light on himself, strips bare what he found rattling around in his heart and invites the listener to follow a deeper and more intimate journey. Fortune is released in the UK this month and has already received a raft of 4 & 5 star reviews. Mat Wale has been writing and recording since early 2004. Rising out of the tumultuous Chesterfield music scene of the mid 2000s that spawned ‘avanGaad’, ‘Vigilante Wing’ and ‘The Culture Thieves’ among others. Whether working with Alt. Country behemoths ‘The Rackets’ (2006-2013 on and off), Grunge/Electro/ Folk duo ‘Arrogant Whale’ (2006-2010), Country Rock outfit ‘Big Convoy’ (2011-Present) or performing solo, Mat is untouched by his peers in terms of sheer volume of work. Unwaveringly sticking to his ‘Lo-Fi’ ideals and grass roots approach to making music, at last count he has independently released 18 E.P.s, 7 albums and provided the soundtrack to Welsh indie film ‘Big Font, Large Spacing’. Over the weekend of February 5th, 6th and 7th, WagonWheel Presents… brings our first mini-festival to The Greystones, Sheffield. After celebrating our 250th show at the end of 2015, we’re kicking off our 10th year with five great shows in three days. We’ve a line up featuring the usual mix of local, UK and international talent that you’d come to expect from a WagonWheel show. Friday night sees us joined by a fine triple bill of bands in The Payroll Union, The Fargo Railroad Co. and The Sopranistas. The Payroll Union are a Sheffield based Americana band with an obsession for American history. The Fargo Railroad Co. have gone from strength to strength since forming in 2013 and have steadily built a reputation as one of Sheffield’s hottest live acts. The Sopranistas are a South London based Alt-Country band led by singer-songwriter Gregory S. Rees. Saturday afternoon will be a slightly more mellow affair in the company of Neil McSweeney. 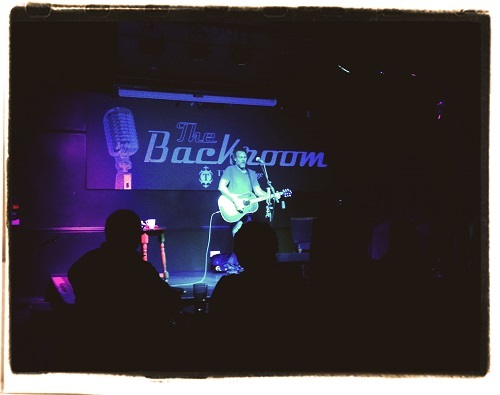 His acoustic guitar playing style combines folk, blues and country influences but it is his voice, likened by The Guardian to a male Tracy Chapman, and his direct and personal lyrics for which he is most recognised. Kicking off Saturday’s proceedings will be Ash Gray. Born in the US to parents form Yorkshire, Gray first began to make inroads into the UK music scene when he assembled the Anglo-American ‘punk-grass’ band, the High-Class Family Butchers during a late-90s sojourn in London. Currently residing in the UK after releasing his latest album Once I Got Burned, today he plays a solo set. We’ll be turning the volume up on Saturday night for evening of 100% Sheffield rock ‘n’ roll with Roaming Son. Easing us into the night will be solo sets from William Barstow and Richard Kitson. Roaming Son draw influences from the sounds of the earliest raucous rock ‘n’ roll bands of the 50’s, but add a distinct sound that is refreshingly modern. Richard Kitson is a renowned folk & Blues artist and dazzling guitarist. William Barstow has recorded and played live throughout the country with former bands The Dead Delta and The Ruby Jacks, compling a selection of bluesy folk songs that didn’t fit into the framework of a hardened rock band. Sunday afternoon sees an all acoustic offering with three wonderful solo artists. Quiet Loner sings songs about love and fear, life and death, despair and hope. On a live stage he is an understated yet powerful performer delivering a show that is emotional, political, occasionally angry but nearly always gentle and human. Boss Caine are a folk/Americana collective from York, England centred around the songs of front man and ‘Yorkshire Cowboy’ – Daniel Lucas (aka GT Turbo), a man described as ‘having a voice that makes Louis Armstrong sound kinda girly’. E.R. Thorpe was born into music – her mother taught her to finger-pick; Her father Kevin was well respected on the blues scene for his albums with Out Of The Blue; And her aunt managed Welsh psychedelic legends Man. Despite this heritage Thorpe has shaped her own evocative sound. Our weekender draws to a close on the Sunday night when US singer/songwriter Rod Picott returns to Sheffield with his brand new album Fortune. It was 2001’s Tiger Tom Dixon’s Blues — a debut album that bridged the gap between between folk and Americana — that officially introduced him as a singer/songwriter, kick starting one of the more acclaimed careers in modern-day roots music. With latest effort Fortune, he shines a light on himself, strips bare what he found rattling around in his heart and invites the listener to follow a deeper and more intimate journey. Opening the show will be Mat Wale. Whether working with Alt. Country behemoths ‘The Rackets’ (2006-2013 on and off), Grunge/Electro/ Folk duo ‘Arrogant Whale’ (2006-2010), Country Rock outfit ‘Big Convoy’ (2011-Present) or performing solo, Mat is untouched by his peers in terms of sheer volume of work and intends to release a new single every month in 2016. Doors for afternoon shows open at 3.15pm and shows finish by 6pm. had a craving for songs of welding, divorce and unemployment certainly had that satisfied when Rod Picott brought the Circus Of Misery & Heartbreak to The Greystones on Thursday night. They maybe even enjoyed the happy song. We certainly did. Thanks to Rod and Mat Wale for another fine opening set plus of course all of you who came along. It’s another quick turnaround until our next show. This coming Tuesday October 21st we welcome another resident of Nashville to Sheffield when Otis Gibbs comes to Shakespeares. You can find full details for this show by clicking here. We’ll be back at The Greystones on Thursday November 20th when Wild Ponies return to Sheffield for their first headline show. Wild Ponies opened for Rod when he was in town last year and also backed him for this own set as part of The Gun Shy Dogs. Support will come from Grassoline. The full preview for this show can be found by clicking here. Hopefully you can join us at one of those, or any other of our upcoming shows that can be found here. billed as England v Italy, but once again the only winner at Shakespeares last night was music. Big, big thanks to three magnificent bands and those of you who were there to enjoy Roaming Son, Stiv Cantarelli & The Silent Strangers and Tsar Nicholas III & The Exiles with us. We can only hope you enjoyed it as much as we did. Tomorrow night (October 16th) we return to The Greystones in the company of one of the great American songwriters, Rod Picott. There’s support from Mat Wale too. You can find full details of this show here. We’re back in the Bard’s Bar on October 21st when Otis Gibbs comes to Shakespeares. Details for this one are here. Maybe we’ll see you at one of those? a bad way to spend a Saturday night, was it? 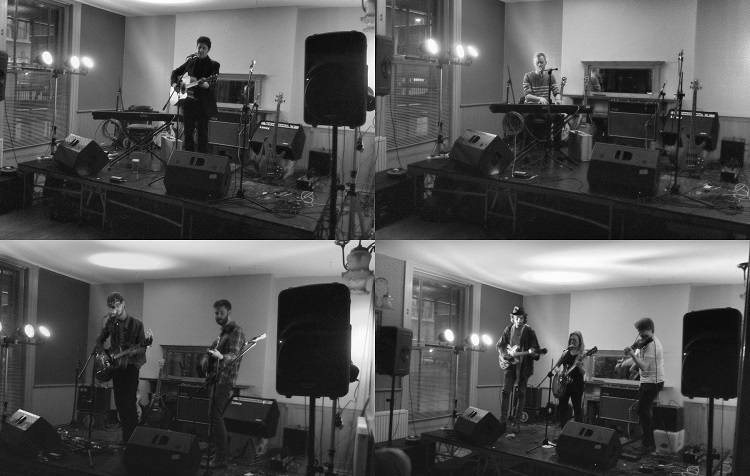 An evening of fine music from The Listeners, Mat Wale, Anytown and Huw Costin. Big thanks to all of them and all who came along to Shakespeares last night too. We certainly enjoyed it a lot. Our next show sees us back in the Bard’s Bar on Saturday September 27th when we’re joined by Matt Andersen and M&J Blues for what promises to be another special night. A full preview for this show can be found by clicking here. We hope you can join us then. show for August, but it was pretty good fun for those that made it out to Shakespeares on Thursday night i think? Thanks to you if you were there and of course to Dave Woodcock & The Dead Comedians, Chris Murphy & Boxer Genius and J. Tilley. September will see us make two visits to the Bard’s Bar, starting one week today on Saturday 6th with The Listeners, Mat Wale, Anytown and Huw Costin. You can find full details for that one by clicking here. And WagonWheel Presents… will be back in out usual last Saturday of the month slot on the 27th when we’re joined by Matt Andersen and M&J Blues. The preview for that one is here. Maybe we’ll see some of you then?